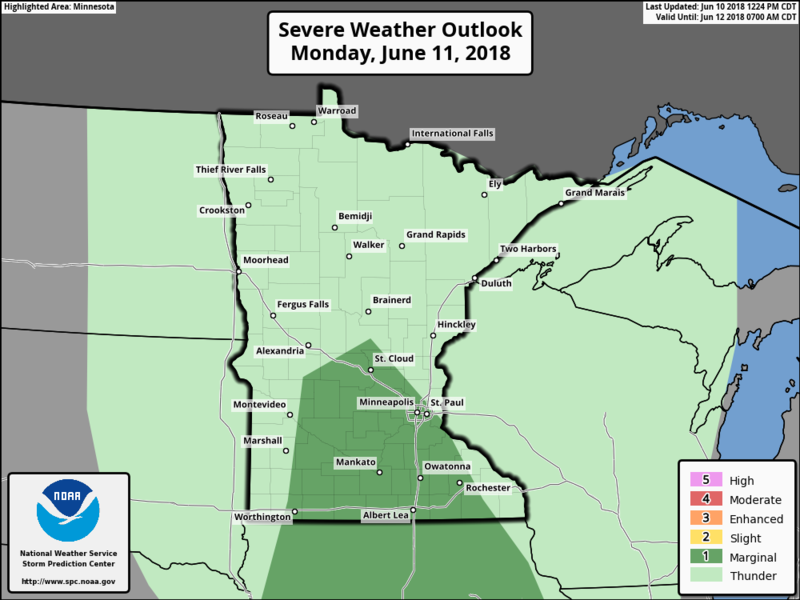 According to NOAA's SPC, there is a MARGINAL risk of severe weather across parts of central and southern Minnesota on Monday. A marginal risk means that isolated severe storms will be possible and will be limited in duration and/or coverage and/or intensity. Stay tuned! The weather outlook from AM Monday to midday Tuesday suggests widely scattered showers and thunderstorms possible across the Upper Midwest on Monday. Keep in mind that some of the storms could be strong to severe, but the threat remains pretty limited across central and southern Minnesota. The rainfall potential through PM Tuesday suggests fairly decent amounts thanks to thunderstorm activity on Monday. Note that most locations will see up to 0.25" to 0.50", while some locations could see up to 0.75" to 1.0"! Alright, well it looks like the worst of the spring allergy season is behind us, but according to Pollen.com, we are still running at MEDIUM allergy levels around the Twin Cities. The forecast through the week ahead keeps us in the medium category, with the exception of Monday when we drop to low levels thanks to rain. With that said, keep the Benedryl handy... ACHOO!! 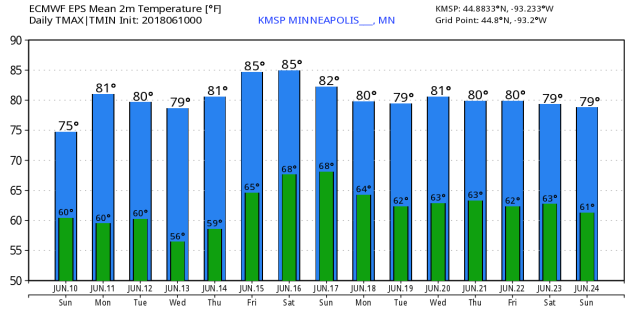 The extended forecast through June 25th & 26th shows fairly steady temperatures continuing over the next couple of weeks with highs generally in the upper 70s and 80s. The images below suggest the GFS (American model) and ECMWF (European model) temperature outlook. Note that the GFS forecast keeps temps a little warmer with highs around 90F on Friday and Satudray, while the ECMWF keeps us a little cooler with highs around 80F. "This Guy Snapped Some Spectacular Pictures of a Tornado in Wyoming (With His Phone!)" 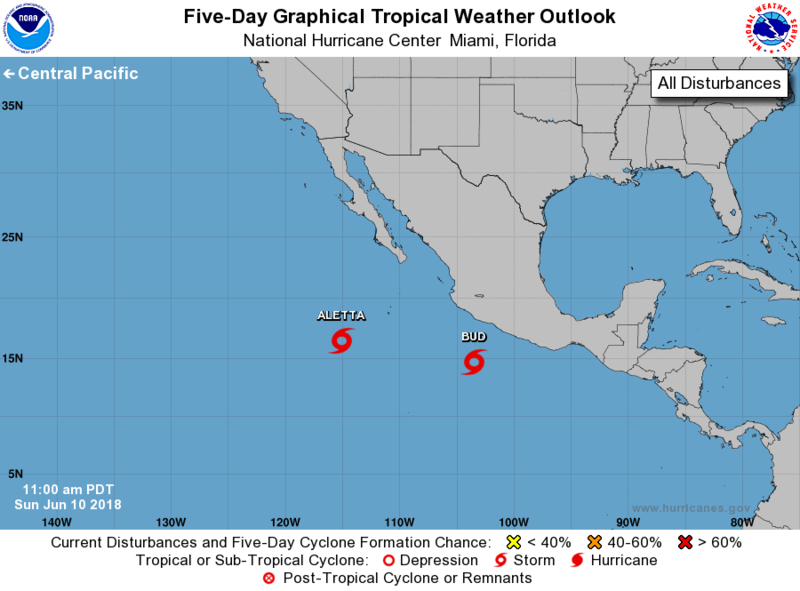 As of Sunday, there were 2 named storms in the Eastern Pacific; Aletta and Bud. 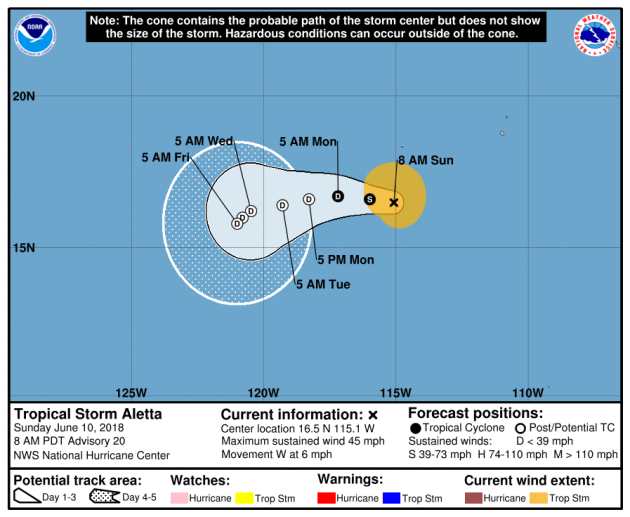 Late last week, Aletta intensified into a strong category 4 hurricane with sustained winds of 140mph, but as of Sunday was a tropical storm with sustained winds 45mph. The official NHC track for Aletta shows it continuing to weaken into the early week time frame. The good news is that this storm will continue to be a "fish storm" and will stay out at sea. Bud is the 2nd named storm of the Eastern Pacific this season and as of PM Sunday had sustained winds of 65mph. 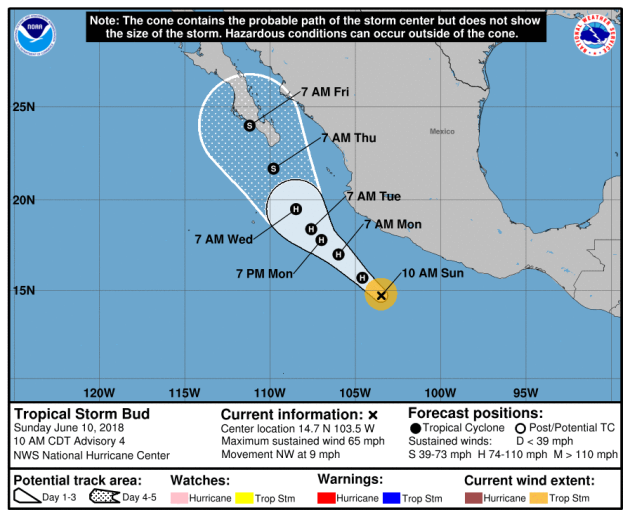 Unfortunately, Bud could be a problem for folks along the Baja California Peninsula later this week. The forecast from the National Hurricane Center for Bud has it becoming a Hurricane and potentially staying a hurricane through midweek. Note the forecast becomes a litte more interesting late this week as it nears the Baja California Peninsula. Stay tuned! The Atlantic remains quiet in the wake of Substropical Storm Alberto that developed in the Gulf of Mexico 2 weeks ago. 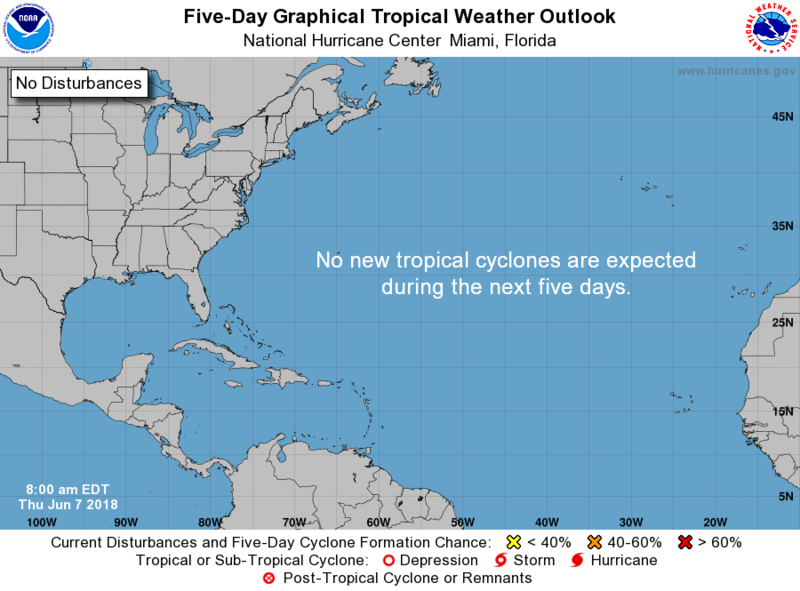 Interestingly, Alberto developed before the official start date of the Atlantic Hurricane Season, which is June 1st - November 30th and while it might seem a little early to see tropical systems develop at this time of the year, it isn’t unheard of. 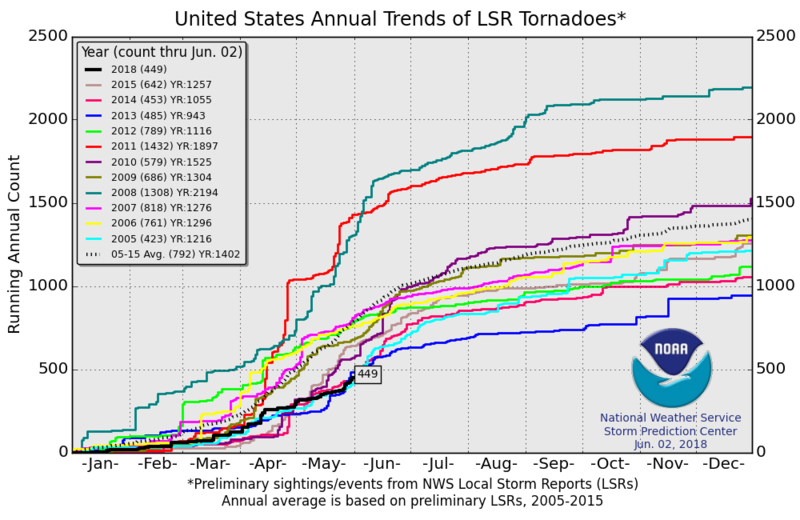 In fact, since 1950, NOAA says there have been 20 Atlantic based name storms that have formed prior to June 1st, 4 of which have occurred since 2012. 1.) 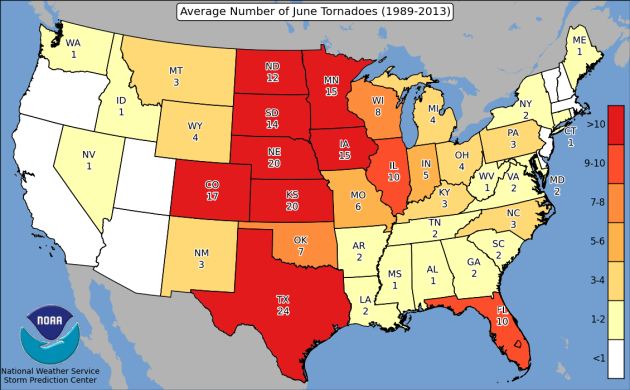 Severe weather for parts of Iowa and southern Minnesota, Mon, Jun 11. 2.) 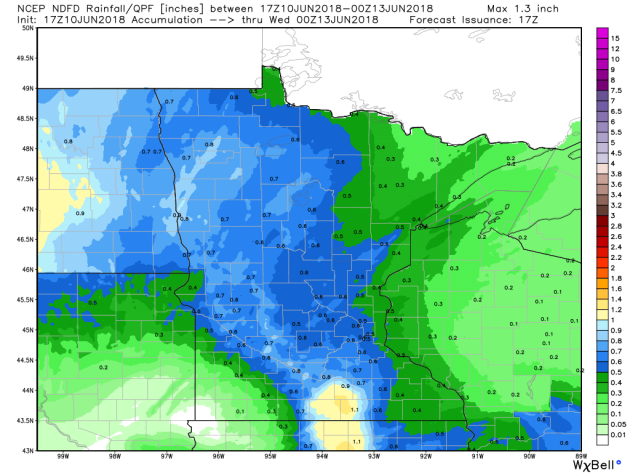 Locally heavy rain for the middle to upper Mississippi Valley, Mon, Jun 11. 3.) Much below-normal temperatures for eastern mainland Alaska, Mon-Tue, Jun 11-12. 4.) Much above-normal temperatures for parts of the western U.S., Tue-Thu, Jun 12-14. 5.) A moderate risk of much above-normal temperatures for the interior Pacific Northwest, Sat-Fri, Jun 16-22. 6.) A slight risk of much above-normal temperatures for parts of the Pacific Northwest, Great Basin, and northern California, Sat-Fri, Jun 16-22. 7.) A moderate risk of heavy precipitation for parts of the Southwest and central to southern Rockies, Sat-Mon, Jun 16-18. 8.) 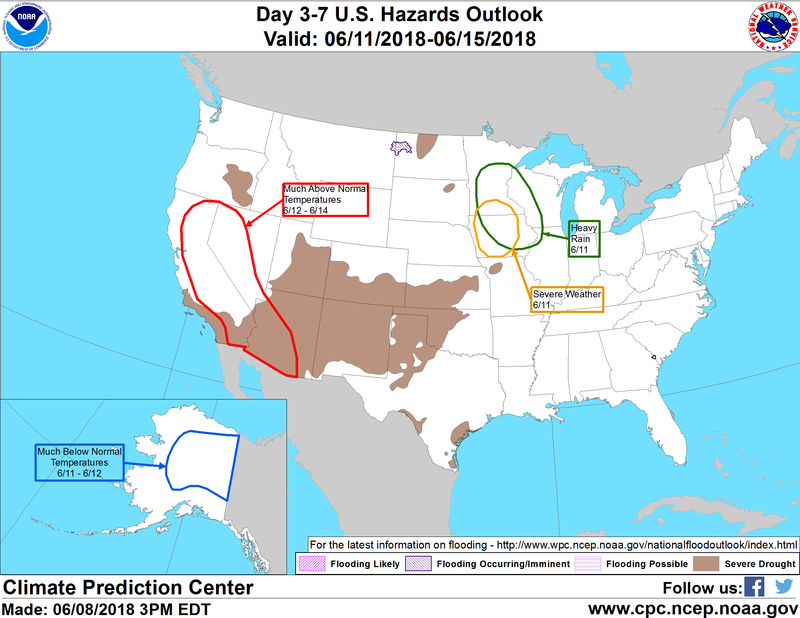 A slight risk of heavy precipitation for the desert Southwest, parts of the Great Basin, central to southern Rockies, and the central high Plains, Sat-Mon, Jun 16-18. 9.) A slight risk of heavy precipitation for parts of the central and eastern U.S., Sat-Wed, Jun 16-20. Flooding occurring or imminent along the Savannah River and upper Missouri River basin. 10.) Severe Drought across parts of the Great Plains, Southwest, Great Basin, California, Oregon, and Missouri. 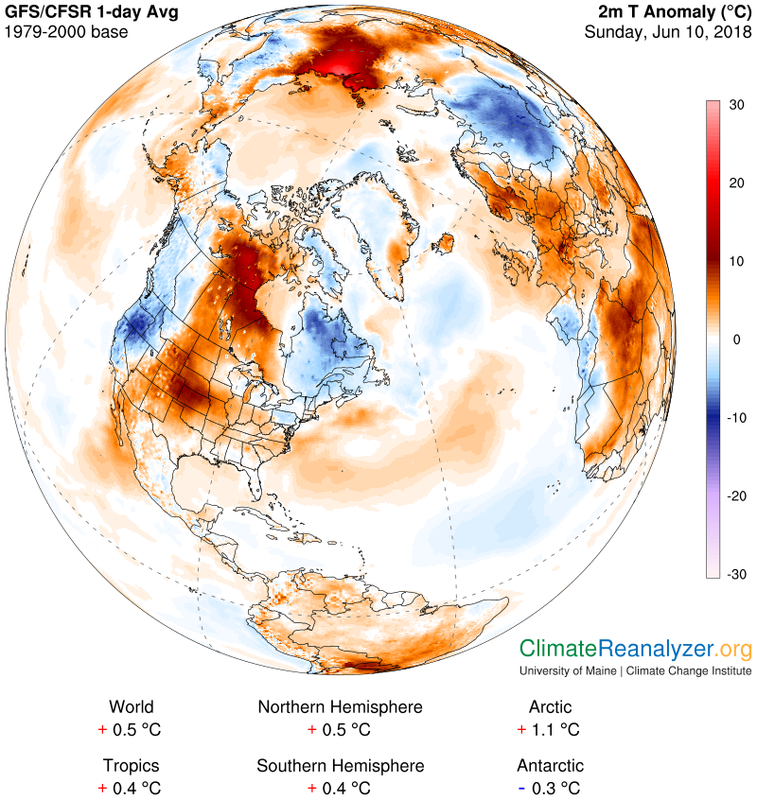 The temperature anomaly across North America from Sunday showed above average temperatures across much of the Central and Eastern US, while cooler than average temps were still in place across parts of the Northeast and now across the Western US. The 850mb temperature anomaly shows warmer than average temperatures continuing across much of the Central US as we head through the first half of the week. However, cooler than average temps will still be found in the Northeast, while another batch of cooler than average temps moves in along the Pacific Northwest and the High Plains before warming back up again. Weather conditions over the next few days will remain fairly active across the Eastern half of the country. A storm system moving through the Upper Midwest could fire up some strong to severe storms on Monday, while a stalled frontal boundary keeps things rather unsettled along and east of the Appalachians. Meanwhile, the Western half of the country looks to remain rather quiet and dry through the first half of the week. According to NOAA's WPC, the 7-day precipitation outlook suggests areas of heavy precipitation across parts of the Central and Eastern US as scattered showers and storms continue there. Some of the heaviest could be found along a stalled frontal boundary that looks to set up from the Midwest to the Ohio Valley and Mid-Atlantic States as stronger thunderstorms over the next few days. Meanwhile, folks in California look to remain dry. I don't know about you, but I sure am enjoying the warm and somewhat humid weather as of late. Minnesotans are fickle. We are a little like Goldilocks and complain when the weather is too cold and suddenly too hot! Dewpoints play a big factor is how we "feel". Anytime the direct measurement of moisture is below 60 degrees, it doesn't feel too bad. However, when that number gets into the 60s, it feels humid and anything in the 70s is tropical! 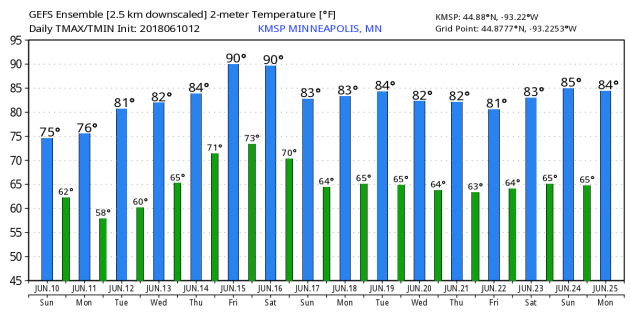 The highest dewpoint ever recorded in the Twin Cities was 82 degrees on July 19, 2011. I think my sunglasses were even sweating that day, good grief! It'll feel quite muggy on Monday as dewpoints warm into the mid/upper 60s ahead of a storm system that could bring strong storms to the region later. NOAA's SPC has parts of southern Minnesota under the highest severe risk, so stay tuned. The front sweeps through Monday night bringing quieter, sunnier and more comfortable weather to backyards near you on Tuesday and Wednesday. No 90s in the 7-day, but I'm sure we'll have plenty more this summer! MONDAY: Muggy. Strong PM storm chance. Winds: ESE 10-15. High: 78. TUESDAY: More sun and much less humid. Winds: NNW 5-10. High: 79. WEDNESDAY: Still nice! A few rumbles at night. Winds: W 5. Wake-up: 58. High: 82. THURSDAY: Getting sticky again. Overnight storm . Winds: W 5. Wake-up: 60. High: 83. FRIDAY: Humid. Late day storms. Winds: ESE 10-15. Wake-up: 63. High: 81. SATURDAY: Unsettled. Chance of T-showers. Winds: SSE 10-15. Wake-up: 65. High: 85. SUNDAY: Mostly cloudy with a few afternoon spits. Winds: WNW 5-10. Wake-up: 68. High: 82. 2011: Severe thunderstorms bring extremely strong wind to central Minnesota. An unofficial wind gust of 119 mph is reported at a seed farm 1 mile northwest of Atwater. A storm chaser's car was battered when he got too close to the storm. Most of the windows in the car were broken. 1996: 5.91 inches of rain fall at Mankato. 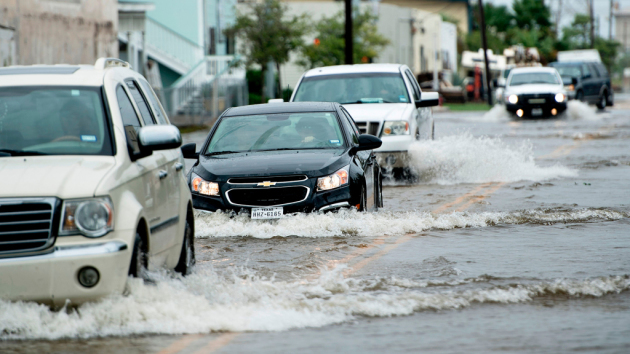 Mudslides close roads, including Hwy. 169, and push a trailer home 20 feet down a hill. 1922: A hailstorm at Maple Plain causes extensive damage to crops. Here's a look at highs and dewpoints across the state on Monday, which suggests temperatures topping out around 80F across the southern half of the state, while folks in northern Minnesota will be closer to 70F. Dewpoints will also be a bit sticky, reaching the mid/upper 60s across the southern half of the state. According to NOAA's CPC, June 18th - 24st will be cooler than average from New Mexico to Colorado, while warmer than average temps will be found across much of the rest of the nation. "Satellite Imagery Is Revolutionizing the World. But Can We Trust What We See?" "IN 1972, the crew of Apollo 17 captured what has become one of the most iconic images of the Earth: the Blue Marble. Biochemist Gregory Petsko described the image as “perfectly representing the human condition of living on an island in the universe.” Many researchers now credit the image as marking the beginning of environmental activism in the U.S. Satellite images are part of the big data revolution. These images are captured through remote sensing technologies – like drones, aerial photographs and satellite sensors – without physical contact or firsthand experience. Algorithms refine these data to describe places and phenomena on the Earth’s surface and in the atmosphere. As a geographer, I work with geospatial data, including satellite images. This imagery offers a powerful way to understand our world. But I think it’s important for people to understand the limitations of this technology, lest they misunderstand what they see. Satellite imagery has made a difference in a wide variety of fields and industries. For example, in 1973, satellite images were first processed to demonstrate seasonal vegetation change. 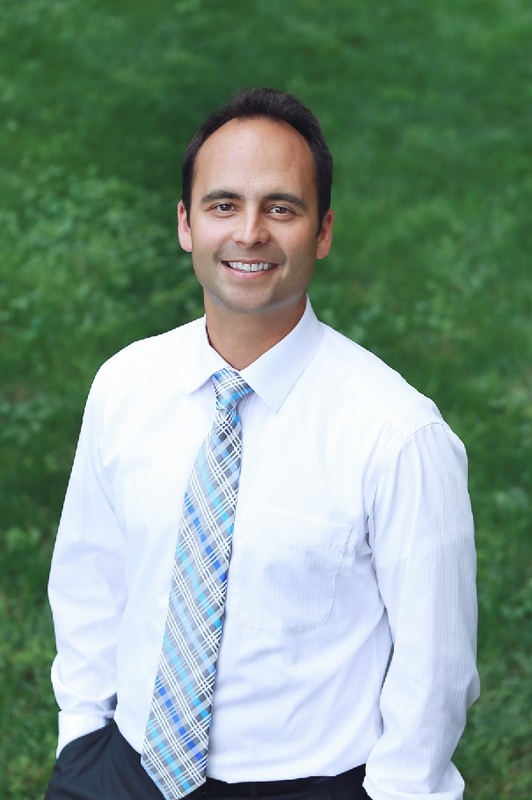 This information now helps to monitor vegetative health and track droughts around the world." "NOAA: Like 2017, 2018 will be a record year for floods"
"This Mindblowing Video of The Moon Coming Down to Earth Is Totally Real"
One minute, you're chilling on a mountain. The next you're being dwarfed by the biggest Moon you've ever seen - one that seems to be coming right down to rest on Earth's surface. That's what appears to be happening in this video on NASA's Astronomy Picture of The Day (APOD) site for 4 June 2018. Of course, we all would have totally noticed if our planet's rocky satellite came down like that, ending life as we know it. So, what's going on here? For starters, check out the full video below, because it's spectacular: What you're looking at is the view of Mount Teide, a volcano in the Canary Islands - taken through a telescopic lens from really, really far away. The Moon we're seeing here is known as a 'milk moon' – the first full moon in the month of May. The footage was captured on May 30 by Daniel López. The people in the video are around 16 kilometres away (10 miles) from the telescope, and funnily enough, they are actually not watching the disappearance of the Moon. These folks are watching the sunrise, which is happening right behind the photographer. To them, the faint morning Moon wouldn't appear any larger than normal. Less Humid Tuesday - Stormy Father's Day Weekend?